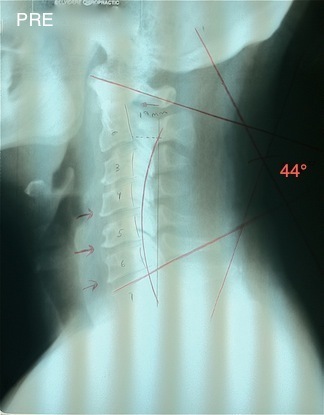 You can see that his neck has lost the normal curve (red line), his head has moved forward, and all but the top disc spaces are decreased with spurs forming indicating disc degeneration that has gone on for decades unchecked and as a consequence has continually gotten progressively worse. Which was causing pressure to the nerves going down to his hand. Once I found out exactly what was causing the problem and exactly what kind of condition his spine was in, and after performing a few other necessary orthopedic and neurological tests (to rule anything else out), I then performed a successful test adjustment (to find out if we could even correct what was causing the problem) I was confident we could help him and put him on a treatment plan which included a set schedule of chiropractic adjustments, in conjunction with a physical therapy modality called electronic muscle stimulation (to help reduce the muscle tightness and joint swelling), as well as certain restrictions on acts of daily living (sitting, standing, sleeping, bending, lifting, etc.) and the home use of therapeutic ice at specific time intervals to control the inflammation (instead of potential dangerous and more expensive oral anti-inflammatories). After treating him 3 times a week for 2 weeks then 2 times a week for 2 more weeks we stopped and took another look and some progress films to see what if anything had changed. Which you can see below to the right next to his initial film for comparison. As you can see, the curve improved slightly toward normal (red line) and his head has moved slightly back. The neck pain and headaches have reduced in intensity, frequency, and duration and he notices less numbness and slightly more strength in his hand. We continued his treatment as planned 2 times a week for 4 more weeks, switching him to a physical therapy modality called intersegmental traction (to help remove joint adhesions and promote regeneration of the degenerated discs), and then re-examined him. At which point he reported was even better had very little neck pain or headaches and his hand is only numb now occasionally and has full strength and complete function again. 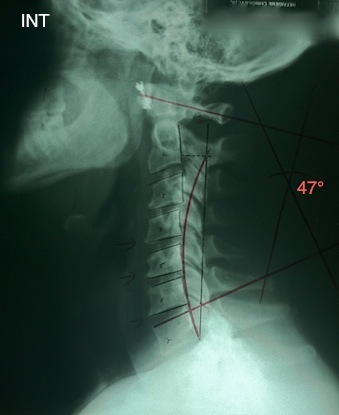 As you can see, the side curve improved significantly toward near normal (red line), his head has moved back toward normal over his shoulders, and he has a slight increase in the heights of the deteriorated discs. 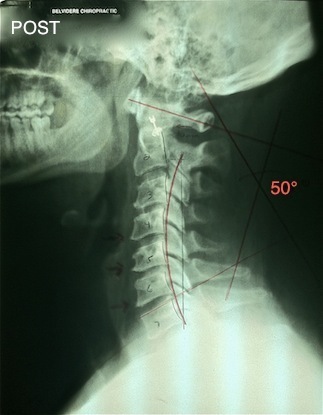 Now he’s far from perfect because of how much damage over decades of neglect and lack of proper chiropractic care, however, his headaches are completely gone, has no numbness or weakness in his hand, and has only occasional neck stiffness that goes away after performing his prescribed exercises and stretches. He didn’t have an unnecessary $5,000.00 surgery, didn’t lose a day of work, went hunting that season and got 3 doe and a buck that helped feed his family for the year.